Practice l ink.com F A ll 2018 75 UNIVERSITY OF VERMONT HEALTH NETWORK – CENTRAL VERMONT MEDICAL CENTER has a reputation for clinical excellence and a staff that is deeply rooted in their community. They will tell you that central Vermont is a wonderful place to live and work. Our abundant natural resources, recreational activities and community spirit create the wonderful and balanced lifestyle many seek. Because we are committed to building and maintaining a top-notch staff our comprehensive benefits package includes: tuition loan repayment, relocation assistance, a guaranteed base salary with bonus opportunities, 10 days of CME, and 36 days of CTO. 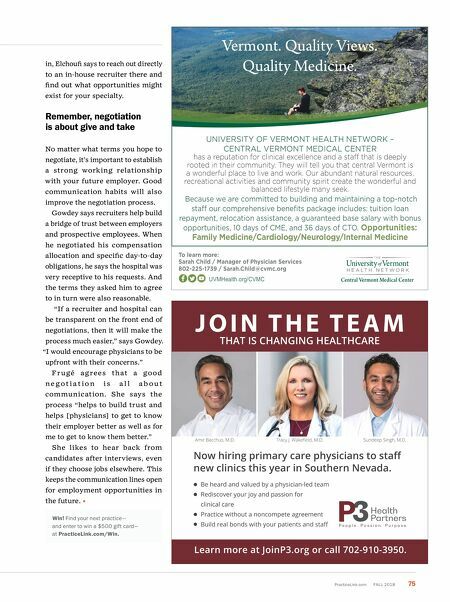 Opportunities: Family Medicine/Cardiology/Neurology/Internal Medicine To learn more: Sarah Child / Manager of Physician Services 802-225-1739 / Sarah.Child@cvmc.org UVMHealth.org/CVMC Vermont. Quality Views. Quality Medicine. in, Elchoufi says to reach out directly to an in-house recruiter there and find out what opportunities might exist for your specialty. Remember, negotiation is about give and take No matter what terms you hope to negotiate, it's important to establish a strong working relationship with your future employer. Good communication habits will also improve the negotiation process. Gowdey says recruiters help build a bridge of trust between employers and prospective employees. When he negotiated his compensation allocation and specific day-to-day obligations, he says the hospital was very receptive to his requests. And the terms they asked him to agree to in turn were also reasonable. "If a recruiter and hospital can be transparent on the front end of negotiations, then it will make the process much easier," says Gowdey. "I would encourage physicians to be upfront with their concerns." F r u gé a g re es t h at a go o d n e g o t i a t i o n i s a l l a b o u t commu nication. 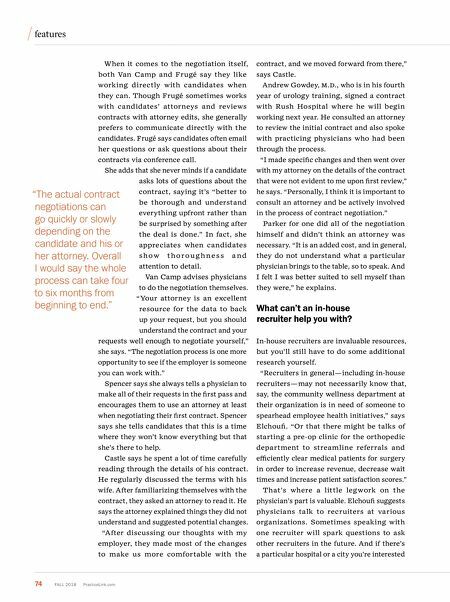 She says the process "helps to build trust and helps [physicians] to get to know their employer better as well as for me to get to know them better." She likes to hear back from candidates after interviews, even if they choose jobs elsewhere. This keeps the communication lines open for employment opportunities in the future. Win! Find your next practice— and enter to win a $500 gift card— at PracticeLink.com/Win.